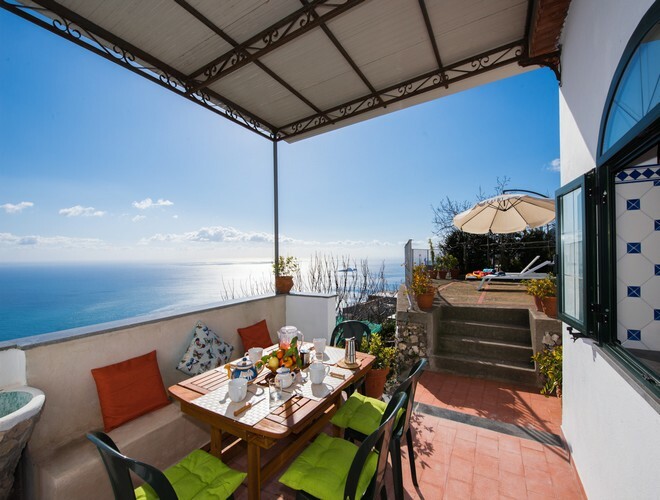 Casa Symphony is a 90-sm apartment situated in Nocelle, the highest area of Positano. Air-conditioning is available in the two bedrooms and in the livingroom. You will enter in a bright livingroom, furnished with a sofa, a dining table with chairs, a TV, the access to the terrace. Both the bedrooms are air-conditioned and have direct access to the sunny terrace, with a breathtaking sea view. The bathrooms are decorated with lucid maiolica tiles, in the typical local style, and are accessible from the corridor. One bathroom has got a shower, a wash basin, a bidet and a toilet. The half bathroom has got a toilet, two wash basins and a washing machine. The kitchen is well equipped with a gas cooker, a fridge, a freezer, a oven, a microwave oven, an Italian-style coffe maker, a toaster and a boiler. Even from the kitchen you can admire the sea. The terrace in front of the house has such a beautiful view of the sea. It's furnished with a bench and a table with chairs to dine al fresco, like locals do. On the right side of the house there is a solarium, equipped with deck chairs and a beach umbrella. The ideal place to sunbathe admiring the gorgeous panorama. Immersed in the nature of the Positano mountains, this apartment is your ideal place to spend a holiday of relax, far from the busy towns. Nocelle is in the highest area of Positano. You can reach the house from the street level in about 5/10 minutes, by walking along this tiny area immersed in the nature. The way from the street to the house also include steps, about 200 in total. You will be in a peaceful place, about 10/20 minutes driving to the Positano centre and at the beginning of the famous Path of the God. We suggest you to come by private driver. Happy to book a transfer for you! We will provide you with bus timetable, if you plan to use the local shuttle that connects Nocelle with the Positano main square. Very close to the house there is a little kiosk where hikers stop by before or after the walk of the Gods. You can go for a fresh drink or for a snack, made with organic local products.